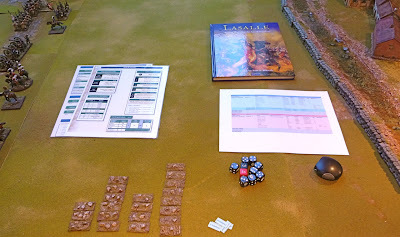 This will be my first attempt to try out the new Lasalle ruleset. 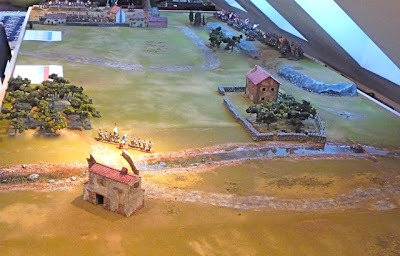 I am a solo wargamer, and only have been at it for about a year. This is my 4th game, the previous have been with card driven games (Field of Battle and Le Feu Sacre). I am sure many errors will be made, but I really like the look of this rule set so I am going to give it a go. My basing scheme is generally compatible with Lasalle. 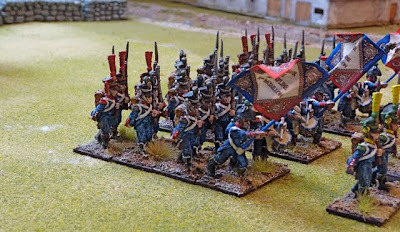 Infantry battalions are usually 4-6 bases, 40x20mm in size. 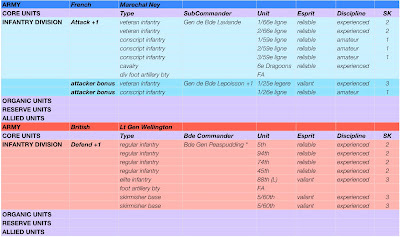 The British have an additional 40x40mm command stand (which is not counted as a stand for Lasalle) for each battalion, this was done to increase the width of the line formation for the British versus the French to make up for the difference between a 2 rank and the 3 rank line typical for each army (and I am not going to change it!!). 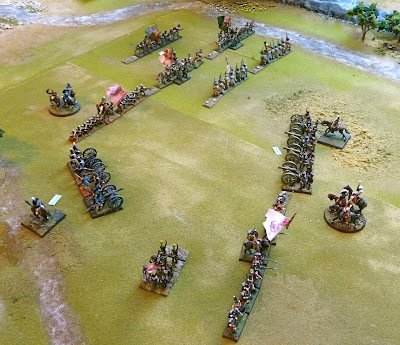 My cavalry units are on 40x40mm bases and vary from 2-6 bases to unit. All very doable, I believe for Lasalle with a 40mm basewidth. 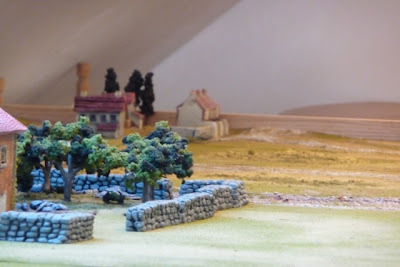 The terrain is set up as follows, it is 6x5ft and relatively simple. Some small forests to the north and south. A ridgeline to the north that should not come into play and the small fortified hill village of Torrecastro to the southwest. The forces start over 20 BW (basewidth) apart. 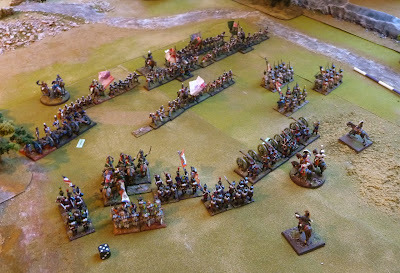 The British start in line with the French infantry in attack column, aside from the French cavalry which are abreast. 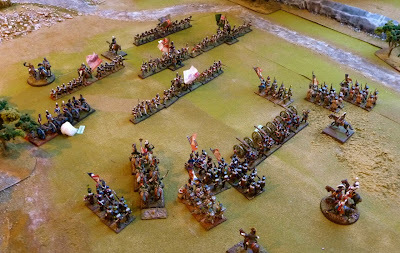 Both artillery units start the game limbered. 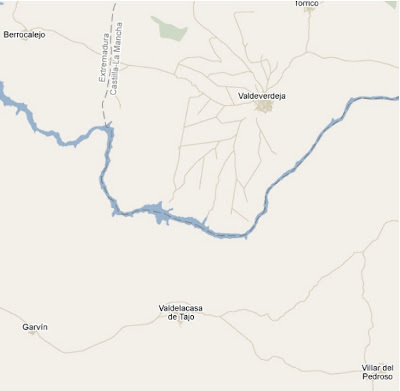 Maréchal Ney has got orders from Major Ducos to advance west toward the village of Torrecastro. He is to take his single division, comprised of foot, horse and cannon and defeat the British forces under Lt Gen Wellington and occupy Torrecastro. He has 2 génerals de brigade, Laviande and Lepoisson with him. Lepoisson is a vigorous leader and assumes command of the veteran infantry units and the artillery. 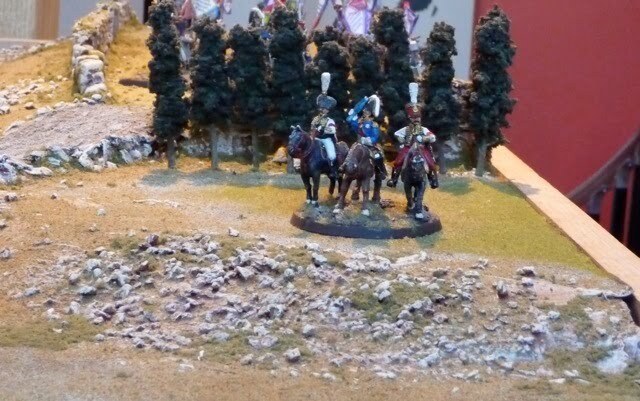 Laviande is an average fellow and is in charge of the conscript infantry units and the 6e Dragoons. I suspect that Maréchal Ney may sent them forward to test the mettle of the British. Fortunately for the British, 2 companies of the 5/60th Royal American Rifles under Captain Frederickson have been just arrived back to Torrecastro to warn Wellington of the French attack. Wellington commands Bde Gen Peaspudding to take command of his 5 infantry battalions, while he takes independent command of the Royal Foot Artillery. 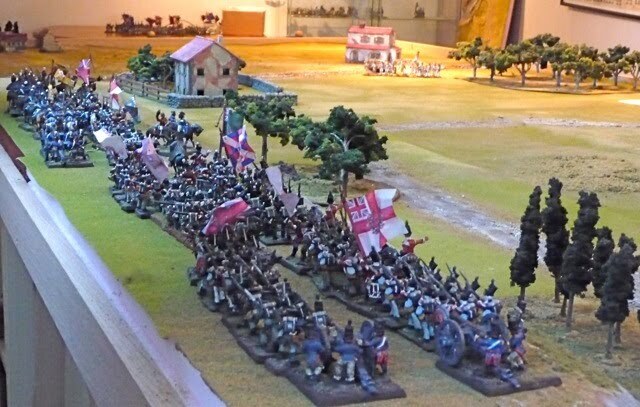 Peaspudding, a clever tactician, arranges his infantry into two long thin red lines and assigns the 2 companies of the 5/60th to the 45th and the 74th Foot. Bde Gen Peaspudding's left wing with 45th and 74th Foot and attached skirmishers from the 5/60th. The 94th is in support. Playing aids and the proof I bought the book!!! 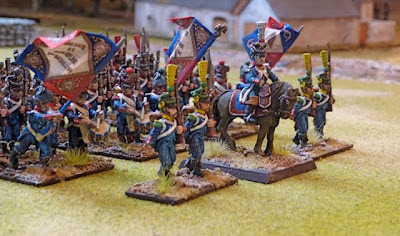 French advance to engage the British. 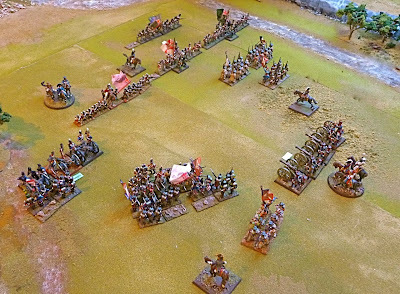 The 6e Dragoons change formation to abreast. 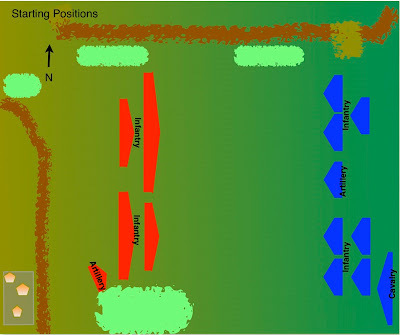 The British left wing advances into a defensive position and the 88th form into attack column to advance, freeing up the extreme right wing for the RFA to advance. The French conscript battalions on the left advance, but have some problems with maneuvering into a favourable position due to their inexperience. The veterans on the right advance. 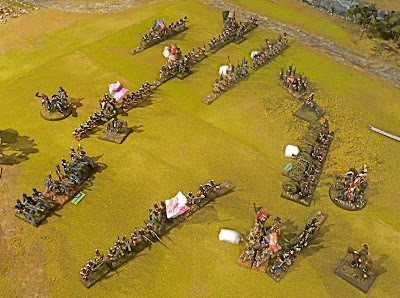 French cannon move into range. The 88th prepare to interpenetrate the 5th. The RFA move into firing range. The RFA unlimber. The 88th interpenetrates the 5th, who survive their DISC test. The French artillery fire at the 5th and the 74th line battalions without success. The 3/59e contacts the RFA. The 2/59e moves in support. 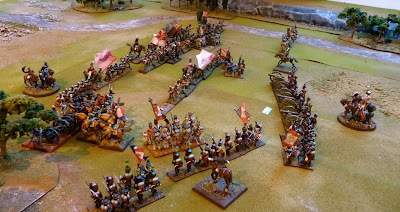 The 6e Dragoons wheel and move in for support. The RFA decide to fire rather than seek refuge with the 5th. 5 hits 2 DISR on the 3/59e!! Further 1 DISR caused in combat and the 3/59e falls back and causes 1 DISR each to the 2/59e and to the 6e Dragoons. 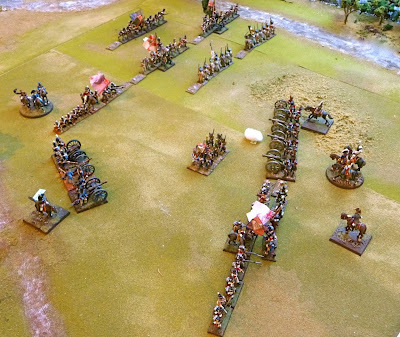 The 88th wheels and charges the 3/59e. The RFA prolong to face the the Laviande's conscript bde. The left wing of the the British maintains it's defensive position. The 1/26e falls back through the 2/59e who fail a DISC test and lose 1 DISR. Finally the French cause some damage when the they fire at the 88th and cause 1 DISR. The French artillery fire at the 74th causing 1 DISR and bounce through causes 1 DISR to the 94th Foot. 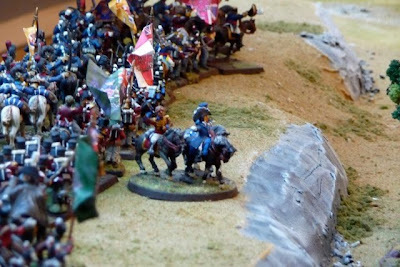 The 6e Dragoons wheel countercharge and contact the 88th. 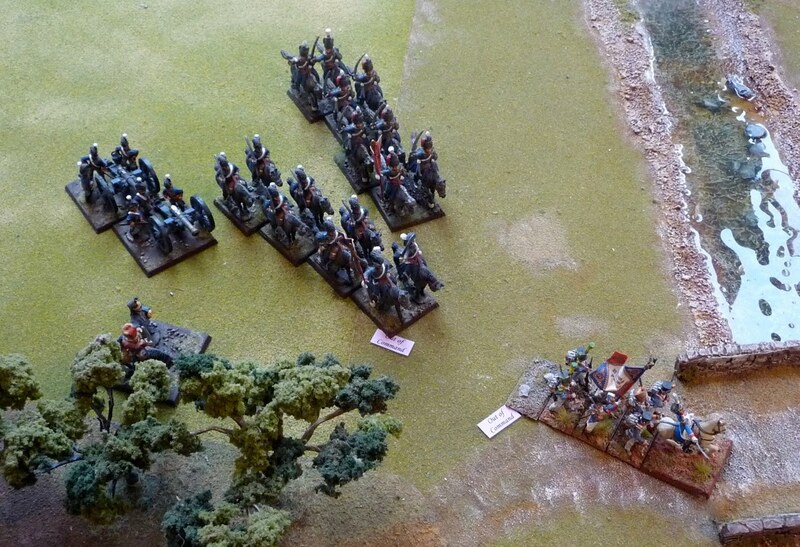 In combat the 6e Dragoons break and are removed from the table. The RFA fires at the 3/59e and they break. The 88th fires at and breaks the 2/59e. 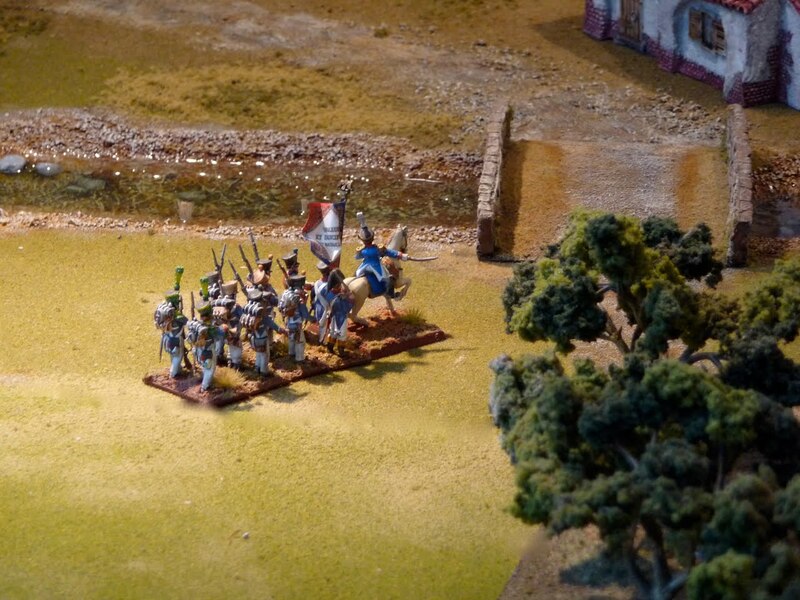 The French are now in range of the British line on the left, the British fire their muskets, 1 DISR on the 1/66e. The 88th now engages the 1/59e in combat. 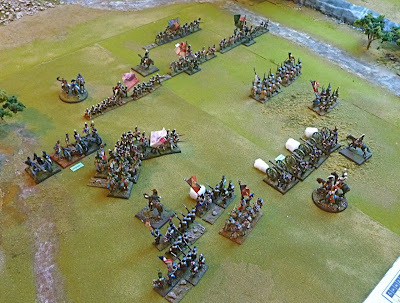 The French conscripts are no match for the Connaught Rangers, further DISR are lost and they fall back through the 1/26e. The 88th now form into line. Laviande's conscript bde is in big trouble. The 1/26 fire without success at the 88th. The French cannon continue to fire roundshot at the British infantry, they should have got closer so they could fire canister. The 1/2 bat 66e ligne fire, but their column of attack is not working against the British left flank. They form line. The 1/26e again fail to pass a DISC test and can not form line. In a desperate attempt to support Laviande, Ney orders Lapoisson to send in the 25e legere. The "Pride of France" wheel to the south to support the left arm of the French attack. Recovery throws are unsuccessful. 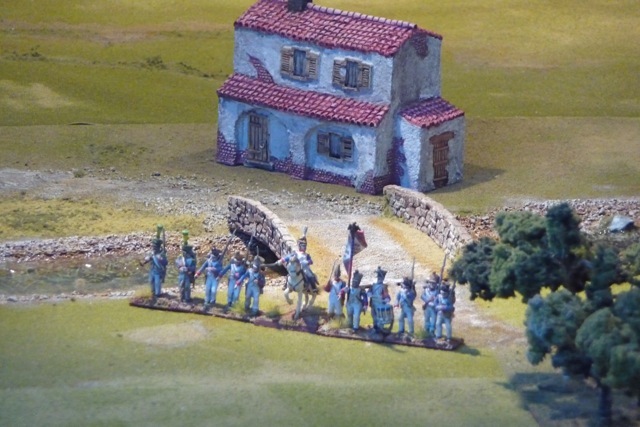 The French pass their Morale test. 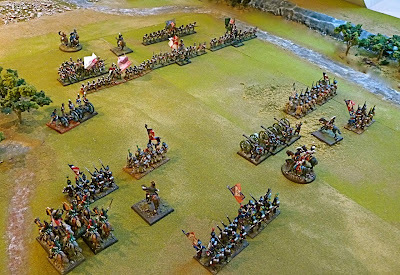 The 88th, 74th and 45th fire at the French infantry and are successful in causing 1 DISR in each case. The RFA prolong towards the French centre. Recovery throws fail. The 1/26e fail to fall back. 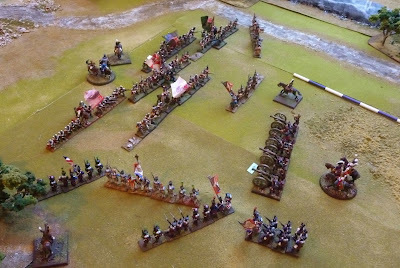 The French artillery can not fire as the 25e legere are in the way. The 1/2 bat 66e ligne fire back at the British left flank and cause 2DISR. Amazingly enough in combat the 1/26e defeat the 88th and they fall back. 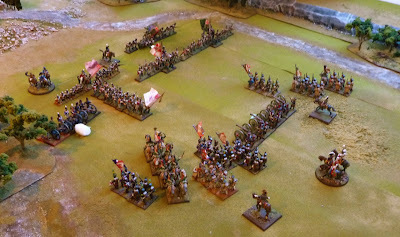 The 25e legere forms into march column to speed their advance south and unblock their cannon. Recovery attempts fail, the French again pass their morale test. The British fire at the French cause some DISR, and at the same time maintain the "thin red line" of defense. 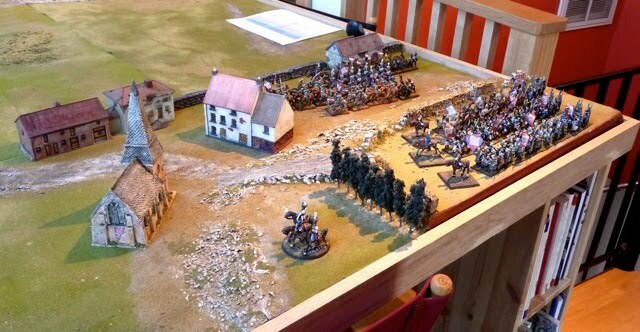 The 88th charge the 1/26e and the RFA prolong to face the the oncoming legere unit. The British are successful in recovering some DISR. 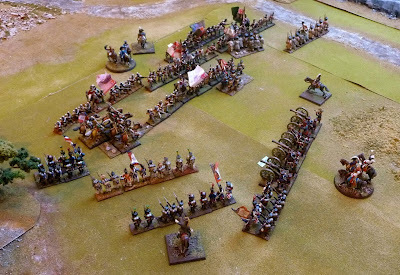 The French fire their cannon and hit the 5th Foot. The 1/2 bat 66e ligne fire at the 74th and 45th with limited success. The 88th are finally successful and break the 1/26e. The 25e legere advance to the rear of the 88th. 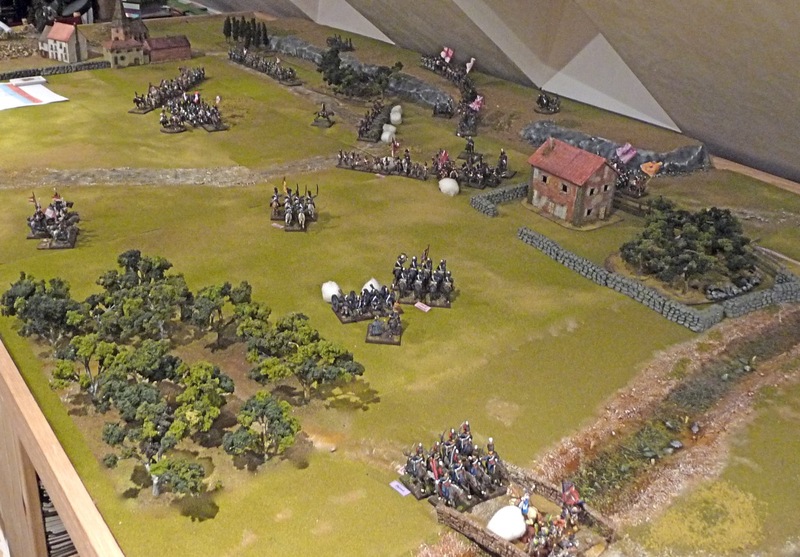 The 74th and 45th continue the musket duel with the 66e, with success. The 88th open up and fire at the 1/59e and they break. The 25e take some canister fire from the RFA. Laviande has lost his bde and retires from the field in ignominy. 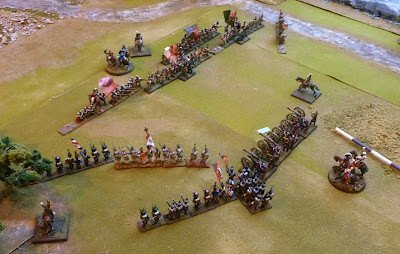 The musket battle continues on the French right with some success. The 25e legere are ready to contact te 88th in the rear once they are able to maneuver. Dice fail, game over. A clear British victory, the French are done. I am a new wargamer and completely botched the French attack. I should have moved the French cannon much closer so I could have been using canister rather than roundshot in order to get the double dice. 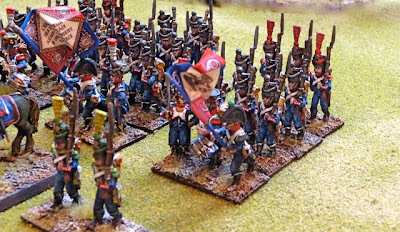 Probably I could have been more aggressive with the French Veteran attack and engaged in combat rather than in a musketry match. I shall learn over time, I suppose. 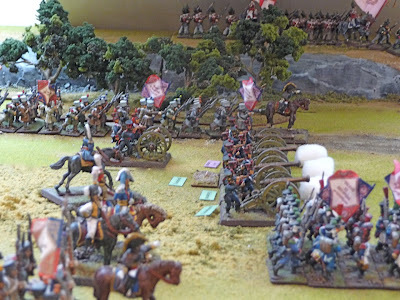 The rules themselves seemed quite good and I did not have any difficulty using them as a solo wargamer. By turn 6, I was starting to get the mechanics down and by turn 10, started to appreciate the differences and advantages of the different grades of units. By the end of the game, I was quickly going through each turn with little reference to the rules. I can say little about their degree of "Napoleonishness" as I am new to the wargaming. What is important to me was that they were easy to understand and apply. As you can see from above, the game is quite fast paced . The only comparison I can make is with Field of Battle which I have played 3 times now. 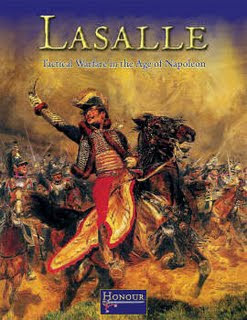 Both games are easy to play, it was nice that I could plan ahead with a specific strategy in Lasalle, unlike FoB which can be unpredictable, but exciting. I am off for the next several days, so I think I will run through the same scenario again quickly, just to get the rules down. I suspect that I will be able to do it solo in an afternoon. The 25e légère is the second light infantry regiment in the French Army of Portugal's 6th Corps, the first being the 6e. For this unit, I decided to go with Foundry figures. 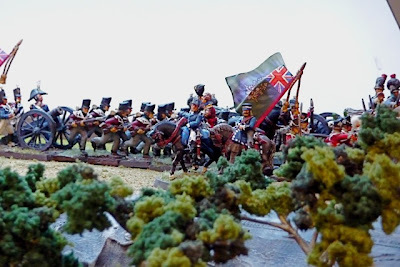 I had not painted Foundry figures as a unit for a couple of years, a regiment deal came up, so I bought some. The figures themselves are very nice, well detailed with only some flash. I like the march pose, and they go together as a unit nicely. I would have no reluctance to buy them again. Foundry figures are certainly a little shorter than Front Rank, Victrix and Perry, but are fine in the same army, I would definitely avoid putting them on the same base and probably the same unit. This is a biggest unit in the Fuentes OB, numbering 1870 all ranks on the field those 3 days in May 1811. 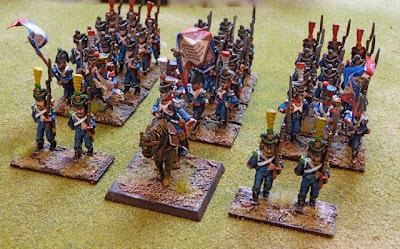 I added a couple of extra stands to my usual 12 for a French 3 battalion regiment, making 14 stands in total. So that was all good, but I did run into some problems. Like I said, I bought a regiment deal, and they all came in one box, loosely packed unlike their usual blister. Easily 1/3 of the bayonets were broken off and at least half the long plumes were broken off the elites. The bayonets did not bother me too much, but the plumes were difficult to glue back on and although you can not see it in the photos there are some lumps of glue on top of the shakos. Second problem was the priming stage, I completely screwed this up. I usually use an automotive white primer that goes on very thin, but at the same time covers well. This time without realizing it I use Rustoleum white primer, which went on thick, like great lumps of s...! I then made a really stupid mistake and tried to rinse it off with water, what I ended up with was these scrofulous looking blisters on one stick of figures. What a nightmare, but I soldiered on. I used my usually thin wash technique with a brighter blue than the ligne. And I think the figures as a group ended up looking ok.
Well that completes the 2nd division in the 6th corps, I will post some photos soon of the complete division. I am also finishing the 1st division with only 30 more figures left to go. Hard to believe, I have my first full corps almost done. 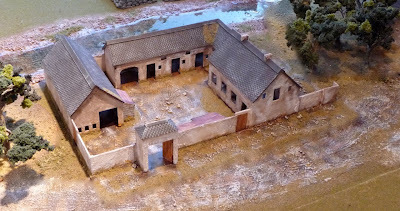 There was a short discussion about La Haye Sainte on TMP a couple of days ago, this reminded me that I bought the Airfix 1:72 scale farmhouse for La Haye Sainte several months ago. Initially when opening the box, I was not too impressed as it seemed quite small and flimsy. But after the discussion, I thought maybe I should take another look. Most of us know it to be impossible to model buildings to scale in 28mm wargaming. The building would be gigantic and would easily take up most of our terrains. Clearly for 28mm wargaming, buildings have to have a small footprint and an exaggerated vertical scale. 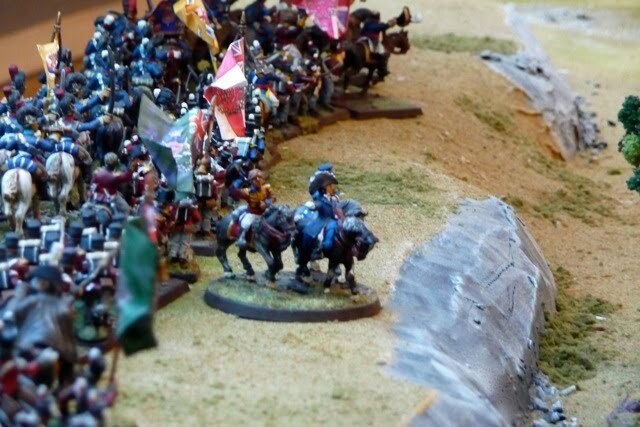 I use Field of Battle rules and the ground scale is 1" to 25 yds. In respect to these rules, a town section is 6x6" and 1 battalion of infantry is allowed in each town square. I generally try to adhere to this and knowing that during the Battle of Waterloo, La Haye Sainte was garrisoned by a single battalion of KGL infantry I was faced with a challenge. Scale in wargaming is all about fudging the numbers, so I felt it was not unreasonable to have a go. I set up the Airfix model and found that I could fit it with some adjustment on a 13x9" terrain piece. This was not too bad as the buildings on their own take up about 60% of the square footage. I can accept that. The building was easy to assemble, I modified the wall to right of the building by shortening by about 3" it so it would fit the base. I primed it white and painted it with GW washes and a GW foundation paint for the roof. The plastic wall have a brick pattern imprinted on them, and as you can see from this photo the wall were actually stuccoed, so I took some dry wall compound and stuccoed the walls. The result is below. I believe it came out OK, although it would be nice if the vertical scale was exaggerated. Of note, Total Battle Miniatures is planning to come out with a range of buildings that indeed reduce the footprint but preserve the height. Now all I need is a scenario to wargame this aspect of the Battle of Waterloo. Maybe I will base it on this excellent resource.